Red Ice had a link to a series of videos on the esoteric founding of the United States called Riddles in Stone. [Update 4/8 – the video has been pulled, unfortunately but you may be able to download it here (I didn’t test it).] 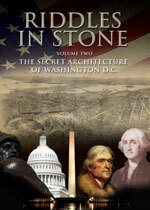 David Ovason has a fascinating book called The Secret Architecture of America that details the connections of the architects of the US capital in DC to Freemasonry, and reveals the occult symbolism that pervades the city’s layout and buildings. Most people are now aware that the “all-seeing eye” on the dollar bill is a Masonic symbol. The film has some fascinating interviews and video footage, but unfortunately the film quality is not that great. I have read many books on this subject, but being able to see films that depict the symbolism in great detail is really quite compelling. The connection of the location of the nation’s capitol building and the Washington Monument to the star Sirius is fascinating. Albert Pike, Masonic historian, has said that Sirius was symbolized by the “Blazing Star,” dating back to the Pentalpha of Pythagoras. The Egyptians symbolized Sirius with the five-pointed star, the half-circle and the obelisk. Pentagrams can be found all over the District of Columbia, and the half-circle is symbolized by the capitol building which is placed directly opposite the Washington Monument. According to Benson Bobrick’s excellent work The Fated Sky, Sibley a Freemason was well practiced in the field of mundane astrology, known for his accurate political predictions regarding both the American and French revolutions. Sibley also predicted that America would one day “have an extensive an dflourishing commerce; advantageous and universal traffic to every quarter of the globe, with great security and prosperity amongst its people,” and eventually be “a new Empire that shall soon or late give laws to the whole world. ” This is rather startling considering the fact that Masonic historian Manly P Hall has reported that the US has a secret destiny: “Thousands of years ago, in Egypt, these mystical orders were aware of the existence of the western hemisphere and the great continent which we call America. The bold resolution was made that this western continent should become the site of the philosophic empire. Just when this was done it is impossible now to say, but certainly the decision was reached prior to the time of Plato, for a thinly veiled statement of this resolution is the substance of his treatise on the Atlantic Islands.” (from Manly P Hall’s Secret Destiny of America). Watch the video and see for yourself! I’ve just watched Part 1, and can’t wait to watch 2 and 3.